I took a deep breath while standing at my kitchen sink this morning after doing the breakfast dishes. One boy ate leftover blue cornmeal pancakes from yesterday morning, and the other several leftover rolled up crêpes spread with an iteration of Megan Gordon's chocolate-hazelnut spread. My timing was on. It was 7:15 and everything was cleaned up. I had my pre-measured coffee beans in the grinder and ready to brew, 2 hours before I usually even think of making my coffee. Not taking into account the time needed to dress myself appropriately, I feel like I'm getting this. My new life is about to start and I have one last week of daily homelife to myself before embarking on this new adventure, new chapter in my life. Before it all begins for real. As this space where I collect my kitchen life felt slowly more and more neglected, I have found all the words pouring around in my head. A food blog is no place to recount the details of broken hearts, and lives forever and irrevocably changed. Or maybe it is. The truth of it all is that the broken bits of my life that have suddenly arranged themselves into a brand new pattern, one I probably would have never put together myself, but also intricate enough that I know the Almighty power behind it all: the One pushing me out and into a place that might feel foreign and uncomfortable. A brand new normal with all of the knowledge of the past decade to back me up. I hesitate to go into detail. Every relationship that comes to an end has moving pieces and two sides to the story. But my conscious is clean. It's the only path through that I could see. For the immediate time being, I'll move through life once again a single person - albeit one with two boys in tow. The inner workings of a girl who has spent 10 years cultivating a home, growing boys and plants, becoming a preserver, a baker, a writer are tough to separate and sift out. I continue to struggle with the feeling that my life, the essence of my personhood, is changing. I'll no longer measure my days with sourdough feeding and line dried clothes. But the slow timing in so much change has convinced me that it is, after all, only change. I'm going to stand at the helm of my kitchen with less time, but never without homemade bread. I will still be me, just with a little less time. Meanwhile, I have been wordless at the outpouring of support from the people in life that have graced me with their friendship. There have been quick notes from those in my tribe, the Internet friends that are real and living and aren't at all hollow and dismissive, and there have been too many coffee beans dropped at my doorstep to count. I am bolstered by support of people who get what it is to be forced into so much change, those who have been through something similar themselves, those whose voices echo that yeah it is hard, but you are able and that trials in life are not purposeless. Those that remind that something good will come again and that it really is an adventure to find out just what that will include. I wondered if this was the right post to include my review of PRiMO's new Strawberry Ancho Preserves, and offer up a jar to give away. I mean really. Life changing, deep sorrowful stuff, written with total ambiguity? But it can't be any other way. Somehow all the little pieces of this gigantic puzzle also include this small company, and their truly homemade jams. Somehow them sending me a jar in the mail (and they have IMPECCABLE packaging which always makes me smile even wider) for me to give my honest opinion of made me feel validated as a small time food writer and recipe developer. This jar was bright and warm, not spicy really - but like the blend of chiles only added to the "strawberryness" of the strawberry. I originally thought that I'd come up with something complicated to showcase it, a mole maybe or a marinade for meat. But then I realized that complicated is just not what I do anymore. I make scones instead of croissants and other laminated doughs. I make a big pot of dal and we eat it for days in a row instead of cooking every night. And this special jar of jam fit right in with the timing of my life which I am ever so mindful of right now. It is perfectly enjoyable on a spoon, in plain yogurt, on toast. It complements all the most comforting things, because after all it is strawberry jam and strawberry jam is king of the jams. And royal jam is meant to be eaten so that you can really taste it. 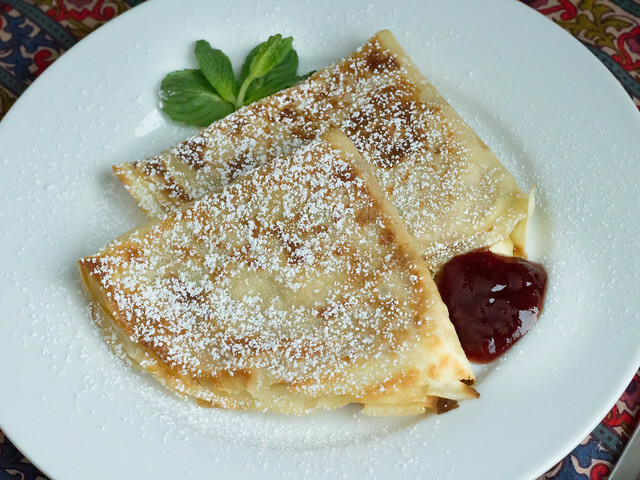 Crêpes might seem like a luxury, but they don't actually take too much time - especially if you mix the blender batter in the evening and let it laze about in your refrigerator for a couple of days. They actually only improve with time. When you get to making the actual crêpes, layer them on a large dinner plate with a square of waxed paper between each and let them cool completely before stashing them in the fridge. Covered well with plastic wrap, you can get another 2-3 days storage out of them. Don't worry if you need a bit of practice to get nice, round crêpes, all of your practice is edible. 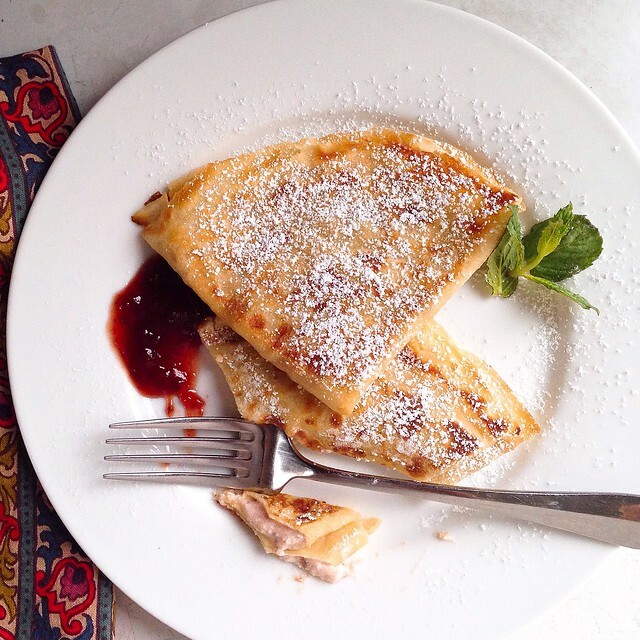 Spread the preserves/ricotta mixture evenly on a crêpe and fold in half and in half again. Melt a little butter in a skillet and gently fry them on both sides until browned and crispy around the edges. Dust with powdered sugar and do eat with mint leaves if you have some growing as I did. I've spent the past month gearing up for my new job, outside of the home, out in the big world that lies past the threshold of my own kingdom. It's been a good run. I'll look back on my 30's at home with general good thought and pride in my independent work. I'll remember all of the lessons learned and remember there are still more to come. When I prepare for the workdays ahead, I page through some of my most favorite simple food books, Peter Miller talking about collaborative lunches at his bookshop, Cal Peternell's chapter on toast, and Tamar Adler's making the most of boiling pot of water and I know life doesn't end with work outside the home no matter how scared I am of that. It's just another chapter in my own running story, one that's still developing and "fast breaking". And that chapter includes a ton of simple food and the pleasures found therein. Is there room for preserves? Most definitely. Certainly, there is ample room to purchase a few jars this year as well, and from a small producer like PRiMO, I'll almost consider them my own. Disclosure: PRiMO did send me a jar of their preserves for review, but as always my thoughts and opinions are fully my own. 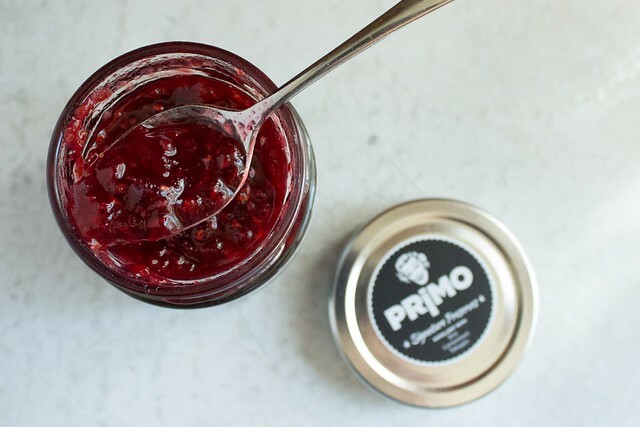 Review: Primo Preserves & Tapenade. Earlier this summer, I was invited to try some handmade preserves from PRiMO. I received the jars, and a charming handwritten note from the owner, and popped them into my china cupboard: excited to try them but waiting for just the right moment of inspiration to hit. Days passed, I admired the jars. I started the beginning of my own summer preserving, and tried to keep up with two active brothers who want nothing more than to be outdoors. Last week, I had a bit of a break when my 9-year-old was away spending a week in the country with my Mom and Dad. I have come to the conclusion that it is exhausting being interested in food when you have a picky eater. I had 6 days where I didn't have to worry one bit about what we were going to eat for breakfast, lunch, and dinner and it was the best gift anyone could give me. We ate leftovers and had a rare dinner out, and I put it on the top of my list to make these jars (or part of these jars anyway) into something special to showcase them. PRiMO is a small company in Denver, CO - and what first struck me was just how personable their PR person was. It seems the whole company is just as down to Earth - and when I tasted their food, I could see why. It's just like homemade, only with the convenience of not making it yourself. I have to admit, when I was contacted I wondered why a specialty food company would want my meager opinion of their preserves! I rarely purchase any jarred foods at all! But with a single taste of the Raspberry-Habanero preserves, I knew why. It's just really that good, and it tasted like I made it myself. 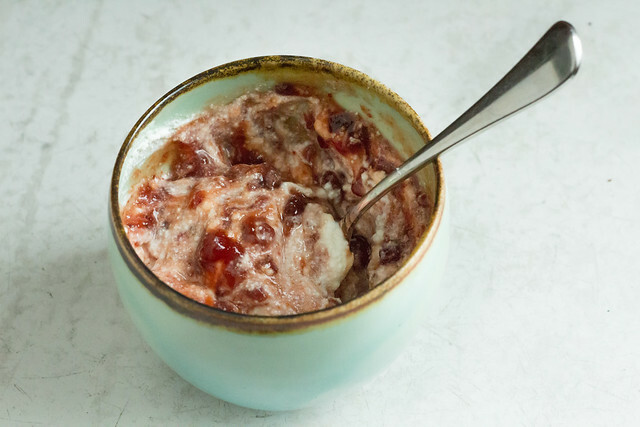 Anything sweet and spicy is right up my alley (remember my obsessions with Strawberry-Guajillo Jam and Candied Jalapenos? ), and these were no exception. But as a time-saver, a gift to mail-order, or just a special indulgence, I can absolutely recommend trying out the PRiMO line of preserves and tapenades. The pasta frolla dough really tastes very similar to a shortbread. 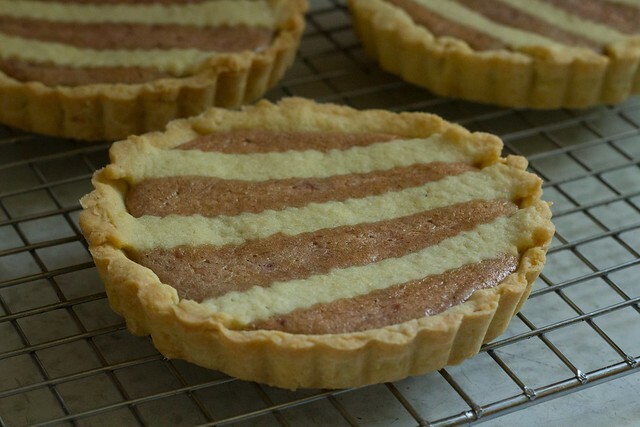 Any tart crust you like could easily stand in for it. Should you make the pasta frolla, be sure to save the scraps and re-roll them into cookies (dock them with a fork first). I baked a small dozen at the same time as the tarts, and enjoyed them alongside the morning coffee. Pulse the sugar, flour, salt, and zest in a food processor until combined. Add the butter and pulse until the mixture is the texture of coarse meal. Empty to a large bowl and form a "well" in the top. (Basically, like how you would go about making homemade pasta.) Add the eggs into the center and beat them with a fork, incorporating flour from around the edges until it gets too difficult to use the fork. Switch to your hands, and gently knead the dough until it comes together into a ball. Form the ball into a disc and wrap in cling film. Let it rest in the fridge for at least 2 hours or overnight. To parbake, preheat oven 400. Roll the dough on a very lightly floured counter (or between plastic wrap or parchment) to about 1/8 inch thickness. Drape onto the tart tins and reposition the dough so that it isn't stretching but fully covers the bottom and sides. Press your fingers or the rolling pin across the top of the tins to remove the additional dough. (Save the scraps to re-roll for cookies, or to add decoration to the tops of the tarts prior to baking.) Place the tart shells on a baking sheet and bake for 10-12 minutes until just barely browned. After par-baking the tart shells, reduce the oven heat to 350. Mix the cream cheese in a mediums sized bowl with a hand mixer until well blended. Add the eggs, and mix well, then fold in the preserves by hand using a spatula. Portion the mixture into the prebaked tart shells (bake any extra filling in a small ramekin alongside the tarts) and return to the oven. Bake for 20-25 minutes until the filling is slightly puffed around the edges and set in the center. I liked these best when they had barely cooled to room temperature, but they were still good when chilled overnight. For the tapenade, I decided to find some nice looking fish and bake it in parchment. One of my favorite, quick "go-to" recipes is some kind of white fish baked with olives, tomatoes, garlic, salt, pepper, fresh herbs, and olive oil - I think it was something I read in Gourmet years and years ago. 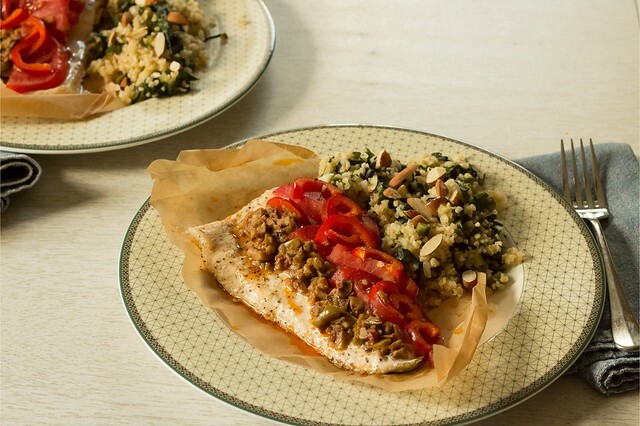 If you are nervous of cooking fish (and I usually am, since I don't cook it as much as I like), put it in parchment and into a 450 degree oven for 10-12 minutes and it's perfect every time. Using a pre-made tapenade like this one, with just a hint of spice, makes it all the easier. Cut large sheets of parchment, and fold them in half (they should be large enough to encase the fillets with 1 inch to spare all the way around after they're folded), and cut them into hearts the way you used to make valentines in the 2nd grade (here's a good tutorial, and I swear, I thought about 2nd grade valentines before watching it!). Arrange a fillet on each, and top with tomato, peppers, and the tapenade. Fold the packet starting at the bottom edge and creasing incrementally on the way up around to the top. 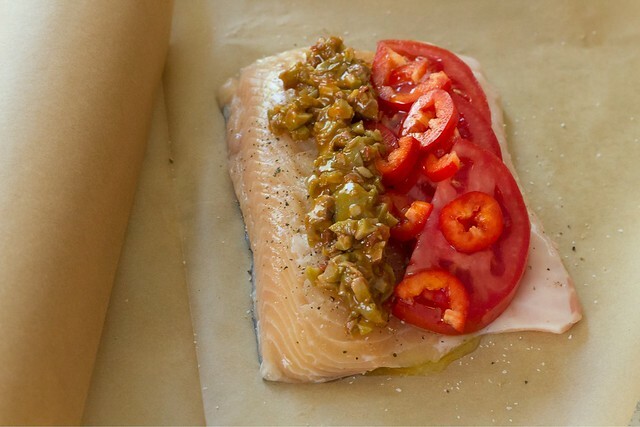 Place packets on a baking sheet and bake for 10-12 minutes depending on the thickness of the fish. Alongside, I made one of the recipes from Maria Speck's excellent new book Simply Ancient Grains. I have quite a lot of rainbow chard growing, and made just a half recipe of the saffron scented yogurt to top the bulgur salad she includes. Our plates seemed so full, but the food wasn't heavy at all and best of all it was ready in a very short amount of time. It was nice having some free time to get some projects out of the way - and this project of tasting and reviewing was definitely a highlight. 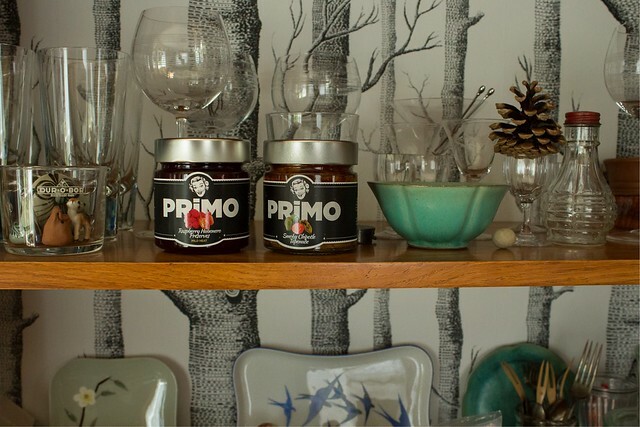 If you find yourself short on time, or just in need of a hostess (or personal) gift, look for PRiMO's line of handmade foodstuffs. I thoroughly enjoyed them! Disclosure: PRiMO sent me the preserves and tapanade to try at no cost, but as always my honest thoughts and opinions are my own.